Dashlane for Internet Explorer can only be installed on an Administrator Windows session, though it is possible to install Dashlane in Chrome or Firefox on a limited or user Windows session. This is because of limitations set by Microsoft for Internet Explorer. So to use Dashlane in Windows, you need to either use an administrator session or to install another browser (Firefox or Chrome). In order to work in your browsers, both Dashlane and your browsers must be run with the same administrator privileges. Please note that if your browser is run as an administrator and Dashlane is run in normal mode, the Dashlane application will not be able to communicate with the Dashlane browser extension. This will result in a grayed-out icon in your browser toolbar. For security reasons, we recommend that you run both Dashlane and your browsers in normal mode and not as an administrator: Applications which are run as an administrator on Windows have full access to your system, which can be dangerous when using a browser. 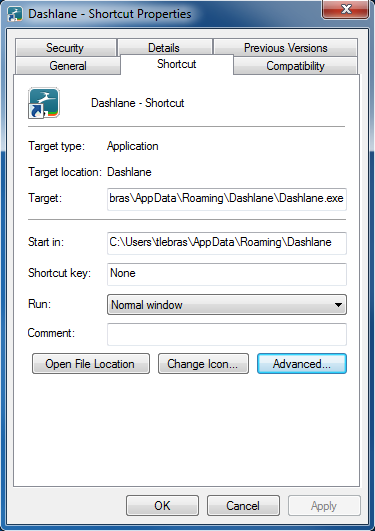 Here is how to make sure that neither Dashlane nor your browsers are run as an administrator. Right-click on the Dashlane shortcuts (on your desktop or/and in your Windows Start menu) and select Properties. Then click the Advanced… button on the Shortcut tab. Make sure that the Run as administrator option is unchecked. 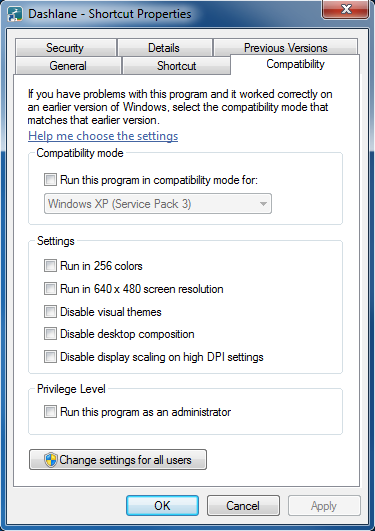 In the Dashlane Properties window, go to the Compatibility tab and make sure that all options are unchecked. Go to the Shortcut tab and click on File location to open a new File Explorer window and show where Dashlane.exe is located. Right-click on the Dashlane application file and select Properties. Go to the Compatibility tab and make sure everything is unchecked. You are now assured that neither Dashlane.exe, nor its shortcut, are run as administrator or with any undesired compatibility options. 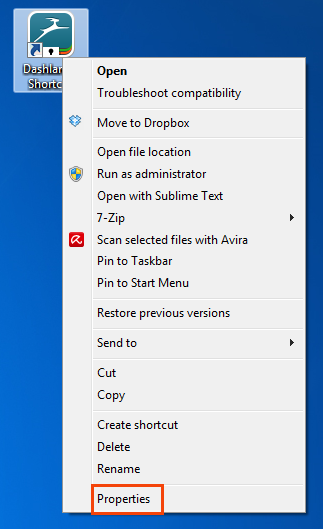 Right-click on the Firefox shortcut (on your desktop or/and in your Windows Start menu) and select Properties. Make sure the Run as administrator option is unchecked. In the Firefox Properties window, go to the Compatibility tab and make sure that all options are unchecked. Go to the Shortcut tab and click on File location to open a new File Explorer window and show where Firefox.exe is located. Right-click on the Firefox application file and select properties. 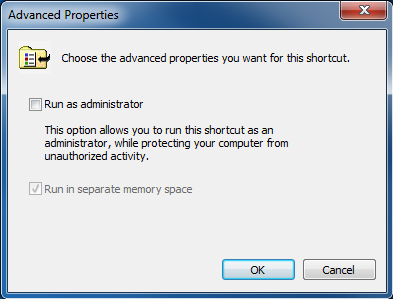 Right-click on the Chrome shortcut (on your desktop or/and in your Windows Start menu) and select Properties. In the Chrome Properties window, go to the Compatibility tab and make sure that all options are unchecked. Go to the Shortcut tab and click on File location to open a new File Explorer window and show where Chrome.exe is located. Right-click on the Chrome application file and select properties.